The home, which cares for up to 34 people, some of whom may have nursing needs, joined the top 3% of adult social care services with the CQC’s top rating following an inspection in November. Residents and relatives told inspectors the service was exceptional with external health care professionals also saying how they were impressed by the caring nature of the staff. The home has also been recognised with a star award by the independent consumer champion, Healthwatch, which praised it for demonstrating strong leadership skills and empowering staff through education, reflection and encouragement. Ros Sanderson, Head of Inspection for Adult Social Care in the North, said: “People were at the heart of the service with dedicated caring professionals. It was encouraging to see people were encouraged to take part in a range of activities to support both their physical and emotional wellbeing. “Staff managed medicines safely. The service maintained a high standard of cleanliness and hygiene. People were supported to access health professionals when required. “CQC often comment on the importance of transparent and excellent leadership. We found that this service was led by an exceptional registered manager who provided strong leadership and led by example. They relentlessly reflected on their own performance and used information from a range of research sources to support people to have the best outcomes. Memory lane provider Yitzi Bamberger said: “All of us at Memory Lane Care Homes are very proud of what Biju together with his staff have achieved at Marigold Nursing Home. Since opening in April 2018 Biju has led by example getting involved in every aspect of the care of our residents. 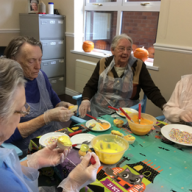 The post The best Marigold nursing home appeared first on Care Home Professional.